Just home late Tuesday night from a few weeks of living a simpler pace and focused on drawing and painting, it's now back to reality - with more annoyances than expected, and our sickening politics. Late Sunday afternoon past a small of plot of beautiful earth about 50 or 60 yards by some 25 yards, high ground separating the Atlantic Ocean and Sea of Abaco, I visited. It's surrounded by a fence of short white pickets. The fence's purpose not to deter but to encircle as if in embrace, to protect, to decorate, and a subtle demand for respect. The elements take a toll on everything; man-made or not. The families of Elbow Cay and Hope Town history - Malone and Albury and Sweeting and Thompson - common. So, too, surnames Lowe, Bethel, and Cash. Known by marker or not here they rest. A sign posted at the entry announces a restoration project for all Hope Town cemeteries (four, all small, come to mind). Opposite the sign a fallen and fractured headstone caught my eye. March 5th fell on Monday in 1888. The last line hit hard. I wondered about her parents and their heartache. 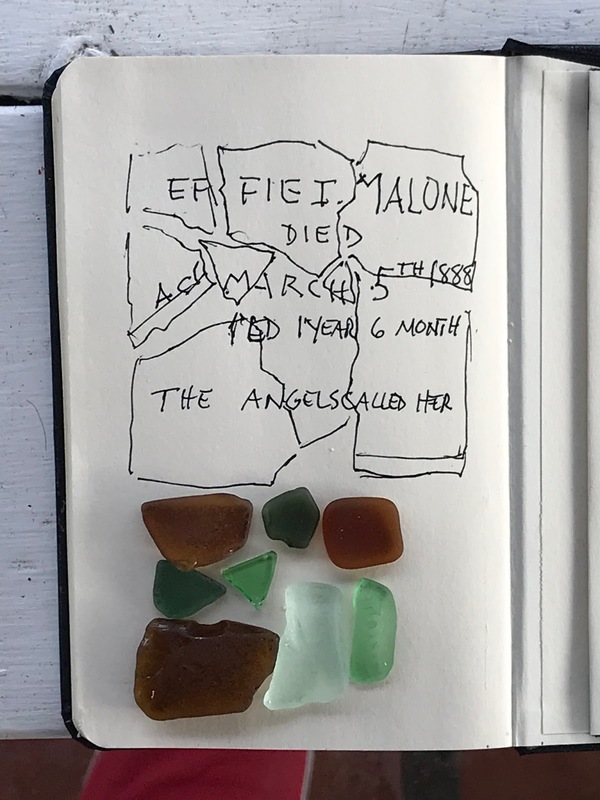 Back at our cottage sea glass, found near a beached sailboat, strewn across a picnic table looked like the fractured stone. So a mosaic. Life is full of interesting parallels. If only to see them. Early the next morning again the angels called - Thomas Winer Malone. He a skilled and well-known builder of Abaco dinghies. Known as Winer (Mister Winer to some), a quiet gent we exchanged passing pleasantries a few times the past 15 years. Unaware he was ill, not a week earlier I sketched his home and adjoining workshop - denoted by a simple but not short white picket fence; meant not to decorate but to protect and deter the curious lured by the sweet sounds of wood being shaped by an artist, and demand respect. Late Monday afternoon Winer, 88, was laid to rest - caddy corner to Effie. Death coming forty-two days shy of 130 years to the day (of Effie) - for March 5th is a Monday this year. I know not if kin but suspect surely. I know folks who own a Winer dinghy. I have painted a Winer dinghy more than once. And now have, fortuitously if not serendipitously, painted Winer's home and boat-building shop. Blessed I am to visit Hope Town and call folks named Malone, Albury, Sweeting, Thompson, Lowe, Bethel, Cash, et al. friends. Many others, too. Sea glass is a work of art and treasure. Headstones are works of art and remind us of treasures. When the angels call - we go. Where there's people there's politics. Politicians are not artists but certainly pieces of work and hardly treasures. When a guest in Hope Town, I draw the line (and paint) and stay out of it. Headstones and treasures endure in Nature and in memory. Great stuff Andy. I know your feeling. On the trips with Nicki, I would return after weeks and never missed the news or those in it. Conditions created by them and of no value.